DIN Standards are issued for a variety of components including industrial fasteners as DIN 404 Slotted Capstan Screws. DIN 404 Screws are manufactured from carbon steel, stainless steel A2 and A4, brass and class 4.8 steel, zinc plated. DIN 404 Screws are available in a wide range of sizes, shapes and materials. DIN 404 Screws are cylindrical rod with a threaded shank and an enlarged round head. 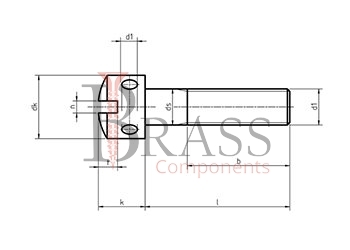 German Standard DIN 404 Screws are available with a torque which is transmitted by a straight slot. 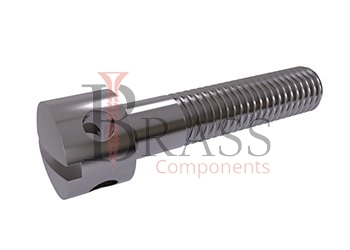 The Structural feature of DIN 404 screw is drilled in the head of the hole. DIN 404 Screws are available with a unique design in the head which is similar to a cheese head in shape have two holes bored through the side of the head at 90 degrees to serve. DIN 404 Screw has an enlarged cylindrical head with a sphere, straight slot and two radial holes. Depending on the purpose of the application, DIN 404 Screw can be available with uncoated or galvanized. In Condition of atmospheric exposure and in corrosive environments, it is necessary to use DIN 404 Screws made of Stainless Steel A2 and A4. DIN 404 Screws prevent unauthorized access to dangerous or closed objects. On the one hand, the range of DIN 404 Screws is crowned with cylinder shaped head. To increase service life, DIN 404 Screws are galvanized. DIN 404 Screws are tightened by Inserting a tee bar into the hole when it is not possible to use a screw driver to tighten the screw. DIN 404 Screws are used in Machine Building, Instrument Making and Other industrial and manufacturing industries in conjunction with nuts, washers of appropriate size. The range of DIN 404 Screws are used as a conventional fastening screw with a stop, but more often used as a filling element of the structure. DIN 404 Screws are installed in the body of the part and can be Used in conjunction with the nut. Through the holes, the sealing wire is passed, tightened and the joint is sealed with a seal. Locking wires can be attached to the cross holes to secure the DIN 404 screw. We manufacture DIN 404 Screws as per Custom Specification and export in France, Italy, Switzerland, Poland, Greece, UK and other European Countries. For more Information, Please Contact Us or Inquiry Now.